Indeed, in general terms, it seems from the New Testament that the less we have to do with the magistrate, the better it will be for us. That's the same R. Scott Clark who was recently stumping for civil magistrate on his blog as discussed at this link. Nevertheless, when it comes to the visible, institutional church, the Scriptures enjoin on us an attitude of submission and a desire to protect those who look after the welfare of our souls that it does not require of us regarding the civil magistrate, who looks after our outward, common, shared life. The magistrate, in his office, is not enjoined to pray for us. a) The duty of submission is a mutual duty of the brethren, not a one-way duty toward elders. Servants, obey in all things your masters according to the flesh; not with eyeservice, as menpleasers; but in singleness of heart, fearing God; and whatsoever ye do, do it heartily, as to the Lord, and not unto men; knowing that of the Lord ye shall receive the reward of the inheritance: for ye serve the Lord Christ. Indeed, these commands are quite closely paired with obedience to the Lord. Obey them that have the rule over you, and submit yourselves: for they watch for your souls, as they that must give account, that they may do it with joy, and not with grief: for that is unprofitable for you. Pray for us: for we trust we have a good conscience, in all things willing to live honestly. Incidentally, the structure of Hebrews 13 is quite beautiful - it includes "Remember them which have the rule over you ... Obey them that have the rule over you ... Salute all them that have the rule over you ...."
d) Furthermore, while there may not be an explicit command for kings to pray for those entrusted to them, that surely is a logical inference to be drawn from the duties of superiors to inferiors. f) Certainly, we should not fall into the opposite extreme from Clark, of some kind of democratic congregationalism and denial that those who have rule over us in the church do not have any rule over us in the church. I hope no one will take my criticism of one imbalance to suggest the opposite imbalance. g) Rather, neither magistrates nor elders of the church are priests whose job it is to stand between us and God. While those who rule over us bring the Word of God to us and set a good example for us (Hebrews 13:7) the great Shepherd of the sheep is Christ (Hebrews 13:20). Christ is Lord over all - both Lord of the Sword and the Gospel. The cattle on a thousand hills are his. 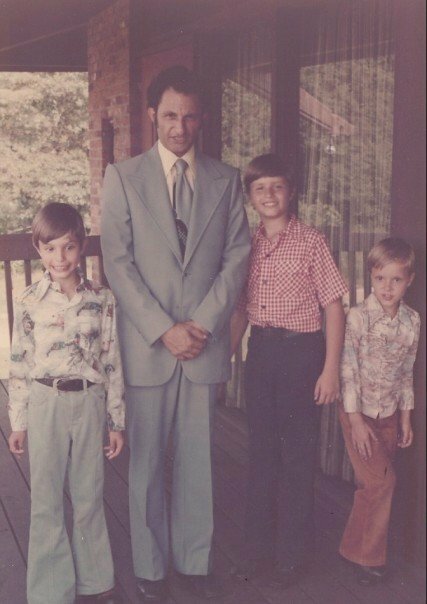 Dr. Ergun Caner has sometimes claimed that he "dressed differently" than typical Americans back when, as a young boy, he was allegedly a devout Muslim. One reason to question this claim is the photo of his father in front of the Islamic Center that he supposedly "built." Someone dressed as an imam is near the center of the picture, and Caner's father is allegedly to his right (our left). But wait, if the Caners dressed differently than typical Americans, wouldn't that appear in photos like this one? I mean - the one surely safe place to wear Islamic garb would surely be right in front of a posted Islamic Center, wouldn't it? Yet even for this picture, Caner's father is wearing typical Western clothes. Also, notice that except for the imam, all the men are in Western clothes. In other words, Caner's father looks like the rule, not the exception, for the Muslims of this particular Islamic Center. 5. Caner claims to have worn a Muslim "keffiyeh"(head covering) before his conversion to Christianity, yet photos show him with his head uncovered. This reveals that he was not a devout Muslim and that he intended to deceive when claiming to be one. Response: Ergun’s brother Emir vouches for their devout Muslim background. He has provided a picture (below) of Ergun with his head covered (sitting down). Of course, there were other times when he had no covering on which would be natural. Other evidence of his being a devout Muslim is available, such as Ergun’s circumcision ceremony and participation in the reading and recitation of the Qur’an. Further, that Ergun was reared a devout Muslim is proven by his father’s testimony recorded in the divorce proceedings documents which ironically Ergun’s critic placed on the internet. Whether or not Caner was a "devout" Muslim is one question - whether Caner regularly dressed like Lawrence of Arabia, is another question. Given that his father apparently did not so dress, even for a posed photo at the Islamic Center with the imam, what are the odds that Caner himself regularly wore Islamic garb to highschool? Notice that Caner proudly posts this picture as his background on his full twitter page (link). Now, not only does Acar plainly not wear any kind of Lawrence of Arabia style headgear, even in this role in a Turkish-American association, he doesn't appear to be wearing Sunni-style robes. In fact, if you look at the page and see all the presidents (including women presidents), you'll see that none of them seem to be wearing distinctively Sunni clothing. Indeed, the women aren't even wearing headscarves. Of course, as we've said elsewhere - dressing in Western style was normal for Turkish Muslims in that era. If Caner had dressed differently, he would have been an unusual Turk indeed. And notice how the sons are dressed in those same pictures: western style clothes. Likewise, remember the yearbook photos from my "Who is Dr. Caner" post (link to post). Notice that although the girl does seem to be dressed up, Caner and all the other males in the picture are wearing typical western clothes. Calvin and Turretin both held to a view of the inspiration and authority of Scripture which affirmed that the Scriptures as originally given were without error in all that they affirmed. The view that Calvin only affirmed the infallibility of the saving content of Scripture rests upon decidedly unpersuasive grounds and conflicts with Calvin’s unambiguous statements to the contrary. Furthermore, the contention that a radical disjunction exists between Calvin’s view of Scripture and that of Turretin remains unproven. While a shift in the form of theological discourse unquestionably took place in the seventeenth century, the content of orthodox doctrine remained substantially the same. Far from dispensing with Calvin’s doctrine of inspiration, Turretin sought to defend it against the new challenges that it faced in the seventeenth century. While his methodology may be questioned, we should be in no doubt that Turretin intended his doctrine to be an expression of continuity with the doctrine expounded by the Reformers. But please read the article for yourselves! I Samuel 5:1-5 And the Philistines took the ark of God, and brought it from Ebenezer unto Ashdod. When the Philistines took the ark of God, they brought it into the house of Dagon, and set it by Dagon. And when they of Ashdod arose early on the morrow, behold, Dagon was fallen upon his face to the earth before the ark of the Lord. And they took Dagon, and set him in his place again. And when they arose early on the morrow morning, behold, Dagon was fallen upon his face to the ground before the ark of the Lord; and the head of Dagon and both the palms of his hands were cut off upon the threshold; only the stump of Dagon was left to him. Therefore neither the priests of Dagon, nor any that come into Dagon's house, tread on the threshold of Dagon in Ashdod unto this day. The idol of Rio de Janeiro purports to be of the true and living God, but it is as helpless as the statue of Dagon. It would be better for the men of Rio to raze this idol, rather than continually repairing it. And it is not only the men of Rio who have such a sad lust for idols. Recall that not long ago God sent lightning and destroyed the statue in Monroe, Ohio (link to story), with again the men saying that they plan to rebuild. Scott Windsor has a post, "The Matter of Hell," in which he sides with unordained Michael Voris against ordained priest Robert Barron. By contrast, Mark Shea has a post, "Michael Voris Again Smears an Innocent Catholic," in which he sides with Barron against Voris. Shea argues that Barron is saying almost exactly what Pope Benedict XVI said on the topic, whereas Windsor argues that Barron's position comes close to falling under the condemnation of the Second Council of Constantinople. Per Windsor, Barron's view is "scandalous at best and perhaps even heretical" whereas Shea thinks "Barron is guilty of no heresy, has said nothing “wrong” and is perfectly within the pale of orthodox speculation." At issue is Barron's apparent view (which he says agrees with Balthazar's view) we should believe that Hell is at least possible (as a metaphor for loneliness from divine love, not actually a place) but that we can reasonably hope that Hell is empty based on God's universal salvific desire. Barron concedes to the big tent nature of Roman Catholicism, pointing out that folks like Augustine and Thomas Aquinas would disagree with him. Now those, such as Ralph Martin who speculate that few will be saved are also (obviously) also within the pale of orthodoxy and share their opinion with not a few Fathers and theologians. But at the end of the day, that’s all you have: two schools of opinion–both of which are allowed by the Church. But it's not just Windsor and Voris vs. Shea and Barron. We could add that we have previously pointed out contemporary cardinals holding that hell may be empty (Cardinal George Pell and Cardinal Cormac Murphy O'Connor). And we could on and on. Although the great Origen erred in hoping for the eventual restoration of all creation, such a view is not consistent with Scripture's teachings both that hell is real and that the punishment of hell is eternal punishment. So, on the one hand, Windsor is right that people like Barron and a couple of Windsor's cardinals are wrong. On the other hand, such a problem is not resolvable on Roman Catholic grounds for basically the reasons that Shea and Barron enunciate: there has been no "official teaching" that anathematizes one or the other position, and consequently both contradictory positions are acceptable, even though both cannot be right. Worse yet for Windsor and Voris, the evidence is that the current hierarchy supports and teaches the erroneous view. I have not confirmed whether Shea is accurate in characterizing the teachings of Benedict XVI, but it clearly extends at least up to the cardinals. The most remarkably thing is that Windsor and Voris continue to trust in this church (which teaches and promotes errors that they themselves are able to identify) rather than trusting in God alone and His Word. They may be able to convince themselves that these same hierarchs would never commit their erroneous doctrines to an allegedly infallible document, but such thinking seems wishful indeed in view of the highly compromised documents of Vatican II, not to mention the victory of the ultramontanists in Vatican I.